This is another installment of a series called “Livermore Stories,” which takes a look at the most exciting wineries in this wine growing region located east of San Francisco. More than 50 wineries now call Livermore Valley home. The wines have never been better, and the wineries have great stories to tell. 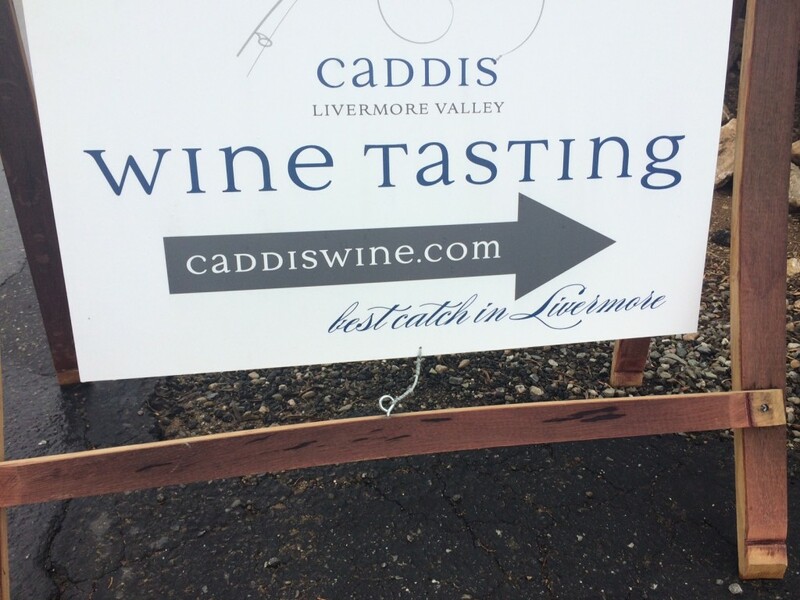 It’s barrel tasting weekend at the end of March in Livermore Valley, and only the third time that Caddis Wines has been open to the public. 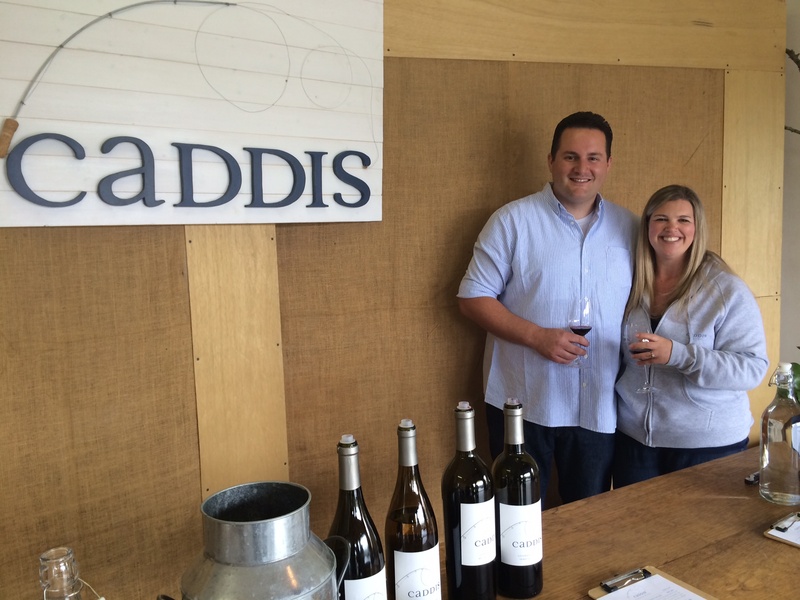 “We’re in our pop up tasting room,” says Chris Sorensen, winemaker and co-owner. “We’re the new guys in town,” adds his co-owner Courtney Garcia. “We’ve been making wine since 2010, all Livermore fruit except our Zinfandel.” That fruit comes from her parent’s vineyard in Sonoma Valley. At a mere 300 cases, “we’re tiny but we’re mighty,” says Courtney. She and Chris met when she started working at nearby Occasio Winery, where Chris is still the assistant winemaker. Courtney is now the events planner at Crocked Vine and Stony Ridge wineries. The two recently wed in June. Caddis is named for Chris’s love of fly fishing. A caddis is a type of insect commonly used as a fishing lure. The Caddis logo, designed by Courtney, is a fly fishing pole with a caddis lure. Chris says Caddis has been in the making since he was 16 years old. He grew up in Livermore Valley, working at Cedar Mountain Winery during high school. “I realized this is a whole lot better than jobs my friends had.” He spent nearly 12 years there before moving on to become associate winemaker at Occasio. Up until a year ago he was also teaching enology classes at the local Las Positas College. Instead of owning vineyards, Caddis prefers to purchase fruit. “We get to pick which vineyards we use to get the highest quality grapes,” Courtney explains. 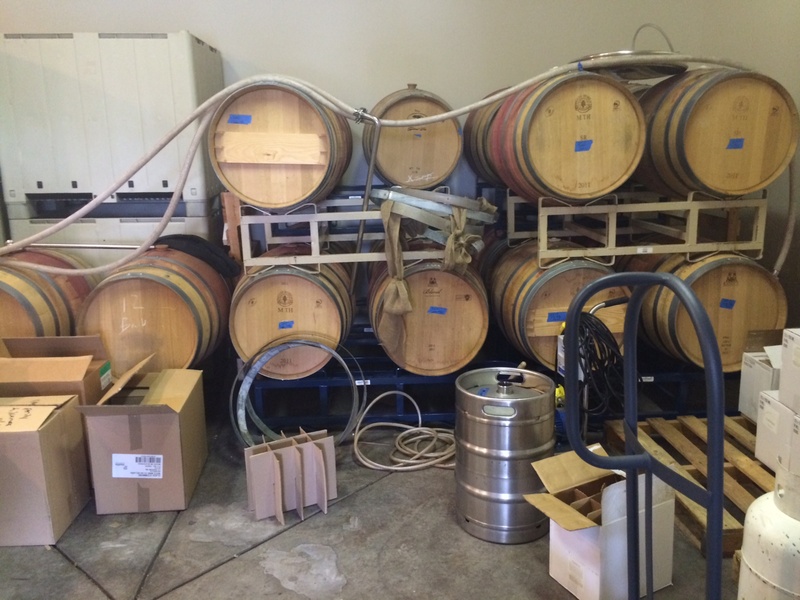 Currently they make Chardonnay, Tempranillo, Zinfandel, Syrah and a Cabernet Syrah blend. Caddis is a garagiste operation in every sense of the word. The pop up tasting room is in the garage fronting the room where Chris makes the wine. He uses a tiny, hand-cranked basket press. “Our biggest grape lot in 2013 was one ton,” he says. “It took us about eight hours to press that with this.” He hopes to get a larger, mechanized press for the upcoming harvest. A luxury for a small winery just starting out. The canvas curtains, hung with fishing hooks, to block off the back of the garage were made by Courtney’s mom, who happens to be here pouring. Her maid of honor is lending a hand too. That’s Chris’s mom over there helping out, and his cousin manning the barrel, drawing wine out for tasting. It doesn’t get any more mom and pop than this. Their current home is becoming an incubator for local wineries. 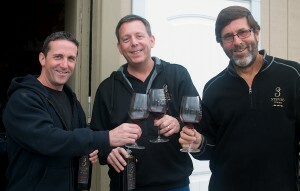 Cuda Ridge Wines got its start here too, moving on to its own digs last year. Wood Family Winery is a neighbor. “Right out of the gate we submitted three wines to the San Francisco Chronicle Wine Competition and all three came back with awards, one of them being our 2011 Tempranillo. That one won a double gold,” says Courtney. 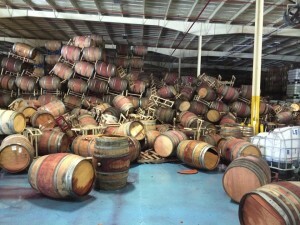 The award winning 2011 is sold out, but I taste the 2012 out of barrel. Instead of being a thin tannic monster that Tempranillo can be, Chris has managed to tame it and highlight the cherry fruit. You can buy futures of the 2012 Tempranillo (which will be bottled this summer). Chris says he started offering futures with this vintage, to help with cash flow, but to also help ensure people who really want the wine get it. Only seven cases will be made. We taste the 2011 and 2012 Chardonnay side by side. The 2011 is crisp, with eight percent Sauvignon Blanc. The Chard fruit comes from the Del Arroyo Vineyard just down the road. The 2012 is 100% Chardonnay, and is richer and creamier. Chris’s 50-50 blend of Cabernet Sauvignon and Syrah is called Better Together. 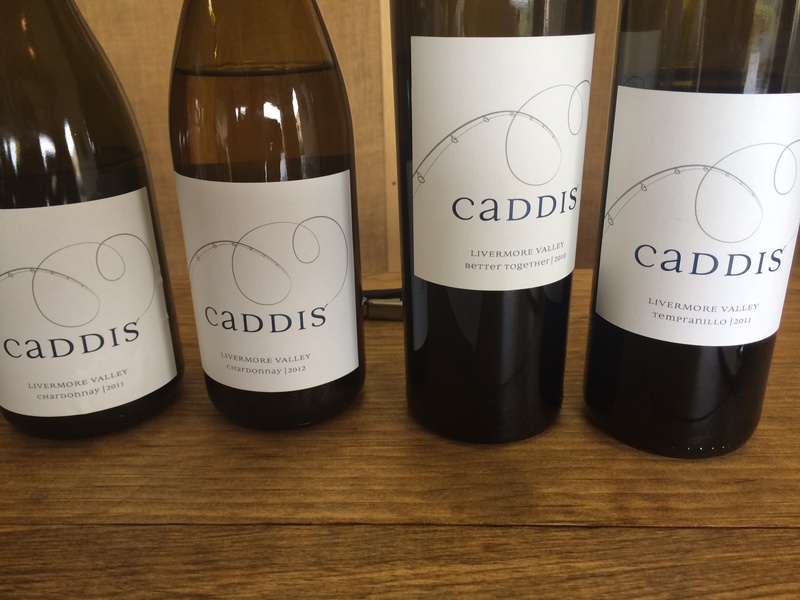 Caddis won a gold in the Chronicle Wine Competition for its 2010 Syrah, but it’s sold out. That Syrah is also in the 2010 Better Together. “We made a barrel of Cab and tasted it with the Syrah and decided it was better together, so that’s where the Better Together blend comes in,” says Courtney.